No retelling of the history of Siroon is complete without a long, glorifying recount of the feats and victories of the Giran Guard, the military of the humble village of Gira. Though their numbers always paled in comparison to the likes of others, such as that of their neighbors and allies from Argonos, the fact they alone defended Gira during three ravaging wars and save it from the fate that most of the Region suffered is nothing short of awe. Most owe this accomplishment to the rigid and ancient discipline through which the recruits are trained, passed down from the very origins of the Siroonian village. The title of Master of Guard belongs their leader, who is not only the most skilled warrior, but also the most prudent. Distinguished by a unique shoulder plate made of brick (a tradition with peculiar roots), the Master of Guard is ultimately responsible for the safety of the village from any threat, in or out of their walls. Their authority is second only to the Guidance of Gira and historically they’ve often, but not always, been chosen to become the latter’s successor. There is disagreement on whether or not the Giran Guard remains as strong as it did during the wars. Many girans, particularly veteran guards, accusing it of getting weak in the relative peace it has enjoyed. Conscription was long abandoned and it now relies entirely on voluntary enrolling. Many of the harsh and sometimes brutal practices of its training process have been dropped as well. All these developments are often pointed out along with the expansion and urbanization of Gira itself, which many girans fear are for the worse. 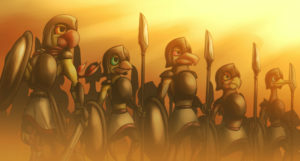 Regardless, the name of the Giran Guard remains respected across all of Avia, reputed for producing some of the strongest and most celebrated warriors in avin history, second only to Hebbeth the Great. Whether it’s by wearing its armor during battle, or its simpler uniform of sash and shoulder cape, being part of the Giran Guard is one of the highest honors amongst Girans and a big source of pride for the village.